Beautiful certificate from the Philatelic Publishing Comp'y issued in 1889. 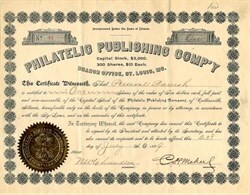 This historic document has an ornate border around it with an embosed corporate seal. This item has the signatures of the Company's President, C. H. Mekeel and Secretary and is over 117 years old. This is the first time we have had this certifcate for sale. The company produced publications relating to the hobby of stamp collecting. C. H. Mekeel was the founder of Mekeel's Weekly Stamp News as well as the CH Mekeel Stamp and Publishing Co. He also discovered the only known Confederate rated 5-cent press printed entire, Scott #137XU1 in 1895.